Lewis Payne (in red) played a key role for Tayport after his introduction. Stock image. Tayport claimed the points from this action-packed Super League encounter at Treaton Park, emerging with a 5-3 victory. Hosts Kennoway Star Hearts had two equalisers during the game, the first from two goals down, but it was Stevie Kay’s men who eventually won the day to notch their first away win of the campaign. The opening goal came Tayport’s way after only four minutes of play when Jamie Mackie’s free kick sailed into the the net. Dayle Robertson began to emerge as a threat to Hearts, dragging one shot wide, then being denied by a last-ditch challenge. Midway through the half, however, Robertson doubled his side’s lead, lifting the ball into the roof of the net from close range. Bt, by half-time, it was all square. 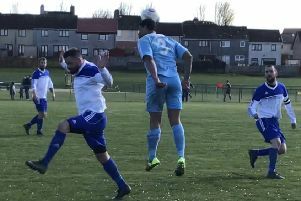 Craig Johnstone converted a 35th minute penalty for KSH, following a hand-ball decision and, four minutes later, Jason Watson’s shot deflected off Ryan Suttie and beat the helpless Shaw. The Canniepairt outfit got their noses back in front when Craig Sturrock hooked home. That lead proved to be short-lived. On 73 minutes, the hosts levelled again, courtesy of Doig’s back-post header. It was the introduction of substitute Lewis Payne which turned the game in Tayport’s favour though. Firstly, Payne gathered the ball wide on the right and raced into the box, delivering a cut-back for Kieran Inglis, whose effort was blocked. Fortunately, ace marksman Dayle Robertson was on hand and he gleefully stabbed home to make it 4-3. With five minutes remaining Payne did well to hold off his marker, turn and lash the bouncing ball past the goalkeeper. Tayport: Shaw, O’ Brien, Dale Robertson, Sturrock(Payne), Suttie, Zata, Gill (Liversedge), Inglis, Dayle Robertson, Mackie, Rollo( Christie).